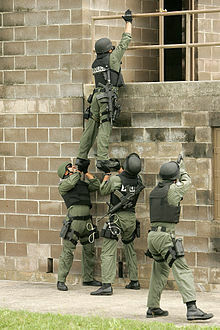 SWAT team members prepare for an exercise. In the United States, a SWAT (Special Weapons and Tactics) team is a law enforcement unit which uses specialized or military equipment and tactics. First created in the 1960s to handle riot control or violent confrontations with criminals, the number and usage of SWAT teams increased in the 1980s and 1990s during the War on Drugs and later in the aftermath of the September 11 attacks. In the United States as of 2005, SWAT teams were deployed 50,000 times every year, almost 80% of the time to serve search warrants, most often for narcotics. SWAT teams are increasingly equipped with military-type hardware and trained to deploy against threats of terrorism, for crowd control, hostage taking, and in situations beyond the capabilities of ordinary law enforcement, sometimes deemed "high-risk". Other countries have developed their own paramilitary police units (PPUs) which are also described as or comparable to SWAT forces. 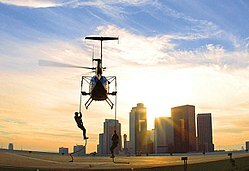 The LAPD Metropolitan Division's "D" Platoon is one of the world's most prominent SWAT units and was the second SWAT team established in the United States, after that of the Philadelphia Police Department in 1964. An officer firing during a SWAT training exercise. ^ "Tactical Response and Operations Standard for Law Enforcement Agencies" (PDF). National Tactical Officers Association. September 2015. Retrieved 2017-05-25. ^ "GUIDELINES for ARMORED RESCUE VEHICLES". 2008-01-01. Archived from the original on 2012-11-05. Retrieved 2011-01-25. Wikimedia Commons has media related to Special Weapons And Tactics (SWAT).